"This recipe was passed from my Yia Yia to her daughter-in-law (my mother) to me. People love this as a Christmas gift. It has gained a big reputation among our friends. One time, my mother donated a small tin of baklava to a church charity auction. It was very competitive, but the price was driven up to $40!" Stir together water, 2 cups sugar, cloves, cinnamon stick, and 1/2 the lemon juice together in a saucepan. Bring to a boil, reduce heat to low, and simmer until flavor blends and syrup consistency is reached, about 15 minutes. Stir remaining 1/2 the lemon juice into syrup. Strain and refrigerate until cool, at least 30 minutes. Stir walnuts, 1 cup sugar, ground cinnamon, and nutmeg together in a bowl. Preheat oven to 350 degrees F (175 degrees C). Brush butter on the bottom and sides of a 9x13-inch glass baking dish. Lay the phyllo dough out on a clean, dry surface and cover it with plastic wrap. Cover the plastic wrap with a damp towel. Lay 1 sheet of phyllo dough in prepared baking dish and lightly brush with butter. Lay another 1 sheet of phyllo dough on top, brush with butter. Repeat layering and brushing with butter with 4 more sheets of phyllo dough. Gently spread 1/3 the walnut mixture in an even layer over the phyllo dough in the baking dish. Place a sheet of phyllo dough over the walnut mixture and brush it with butter. Repeat layering and buttering with 3 more sheets of dough. Spread another 1/3 the walnut mixture in an even layer over the phyllo dough in the baking dish. Place a sheet of phyllo dough over the walnut mixture and brush it with butter. Repeat layering and buttering with 3 more sheets of dough. Spread the remaining 1/3 walnut mixture in an even layer over the phyllo dough in the baking dish. Place a sheet of phyllo dough over the walnut mixture and brush it with butter. Repeat layering and buttering with the remaining 5 sheets of dough. Cut baklava into 1-inch diamonds. Bake in the preheated oven until lightly golden brown, 35 to 45 minutes. Pour cooled syrup over baked baklava and cool for 1 day to absorb syrup. Cutting the baklava is done easiest with a large butchers knife and a gentle hand to hold down the top phyllo dough layers while cutting. To cut in diamonds, make 4 even cuts down the length of the pan, and then make cuts diagonally beginning at the corner. Phyllo dough dries out quickly and becomes difficult to work with, so it is best to work quickly. 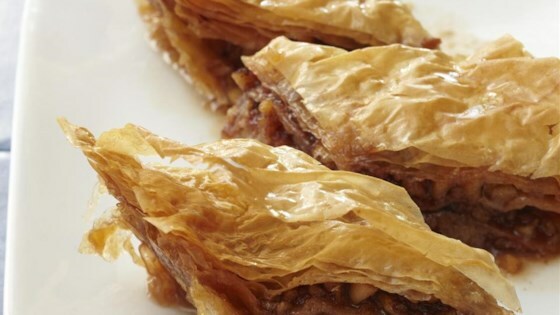 Using a glass baking dish is best, because it allows the cook to see if the bottom of the baklava is getting golden brown. I serve it in cupcake tins. Be sure to store it uncovered, so that it will stay moist.